I do not have a dehydrator in Israel, but I still sprout my nuts, for eating. However, sometimes I sprout too many and don’t want them to go rancid, so I turn them into cookies and make Health Starts Here cookies! (If you have a dehydrator, then dehydrate them to keep them raw. If you are like me, without one at the moment, bake away and send love vibes into the oven). Enjoy this recipe, as it was made with extra love. 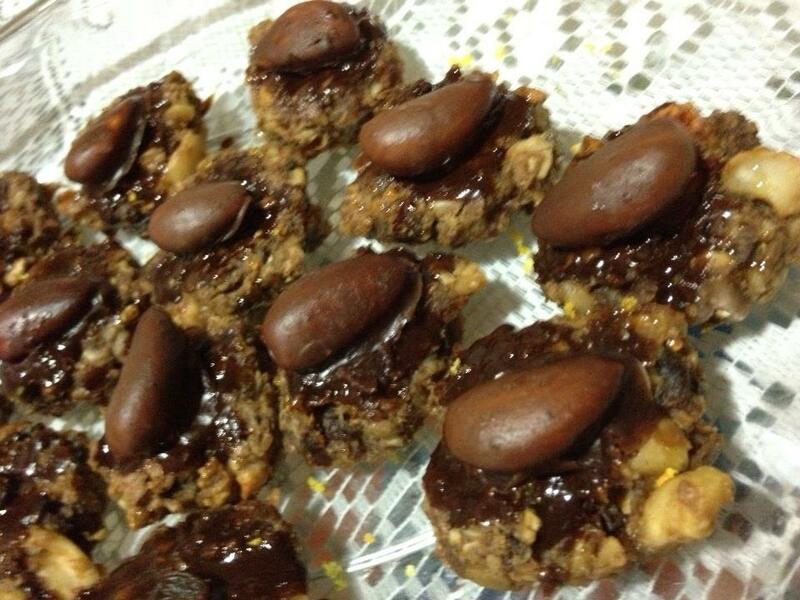 Sprouted Nut Cookies garnished with orange zest and chocolate covered almonds. Mix all ingredients together, shape into cookies and bake at 350 for 20 minutes, flip and bake additional 20 minutes. mix all ingredients together and spread over cookies, once they have cooled. Refrigerate to let the chocolate sauce harden. (To make chocolate covered almonds, or any other garnish, dip almonds in chocolate and refrigerate).